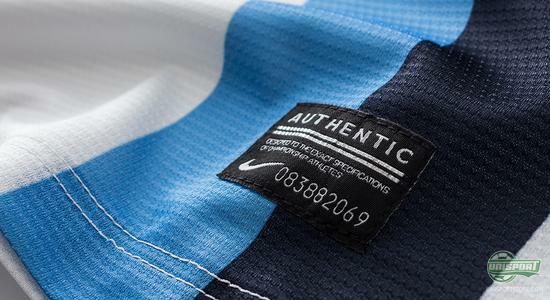 Just last week Manchester City revealed the clubs new third shirt, and we have now taken a closer look at the elegant shirt from Nike that Sergio Agüero, Yaya Toure and the rest of the players will wear in the hunt for success. It is a new and exciting cooperation between Nike and Manchester City. The Americans took over as shirt sponsors from Umbro this summer; and so far Nike have delivered an elegant home shirt with the classic sky blue colour, and a just as classic black away shirt, and now also this very elegant white third shirt with a sky blue and navy stripe running down the shirt. The latest addition to Nike and Manchester City's exciting cooperation is now here, so come along and let's get a closer look. For the Manchester City third shirt, Nike have chosen the stylish and classic solution. White has always been a classy and beautiful colour for a football shirt, and this shirt is no different with its elegant display including the beautiful Manchester City logo, as always, found on the chest. In addition, Nike have included vertical stripe running down the shirt, which provides a dynamic and modern look. Are you a City fan, and would like to support the club on its hunt for cup glory, then you order the new shirt right here  prices from 70. The colouring for the vertical stripe is sky blue and navy, almost the exact same colours as we know from the home shirt and away shirt. 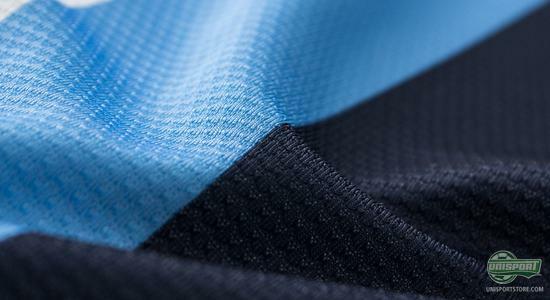 Hereby, any Manchester City fan can carry the beautiful colours of the clubs shirt selection on the new third shirt, which The Citizens will wear throughout the current season, as they will aim for yet another championship to the collection. 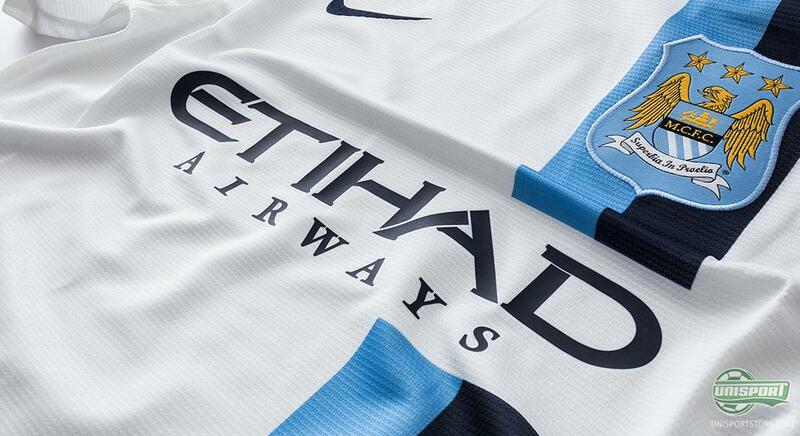 Manchester City will wear this shirt for all of their away matches in the various cup tournaments, and we have already seen the elegant shirt in action in the Champions League. Here, both the new shirt and Manchester City got a perfect start to the tournament with an impressive 3-0 victory against Viktoria Plzen. This shirt surely speaks to the faithful City fans. 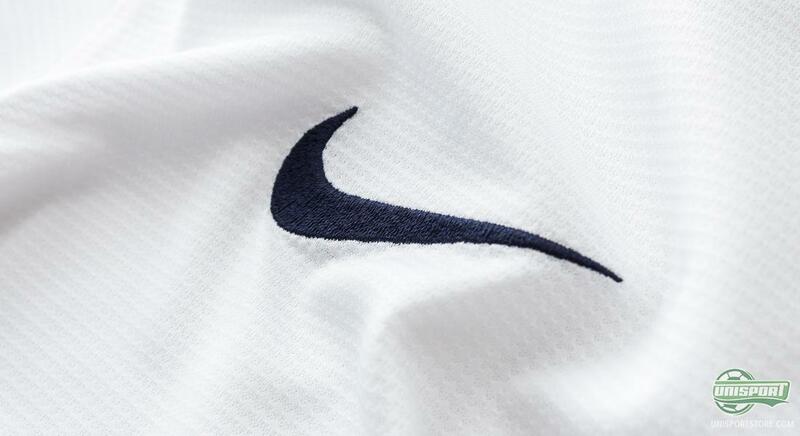 Nike have not only made a shirt that is nice to look at, they have also considered the proud tradition in the club. 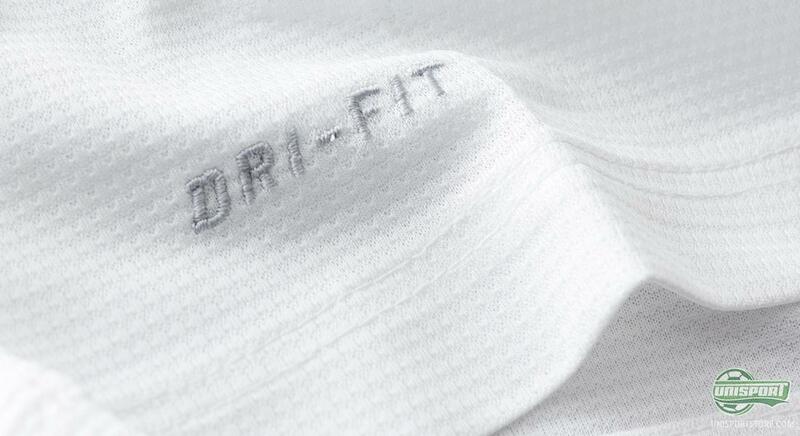 On the inside of the collar you will find a little label with the text Pride In Battle, which is the translation of the club's Latin motto Superbia in Proelio. The shirt is made with Nike's well-known Dri-Fit material, which is designed to wick moisture and sweat from your body and keep you nice and dry, even in the most demanding situations. 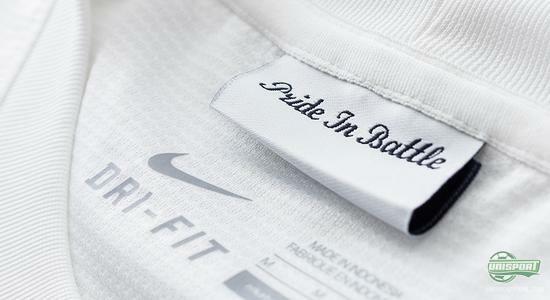 Nike have also considered the environment when producing this shirt, and it has been made from recycled polyester. Actually the shirt may have been made from up to 13 recycled plastic bottles, and hereby Nike and Manchester City show that they are joining in on the fight against the climate issues we are all facing. It shall be exciting to see if this new third shirt will be successful. 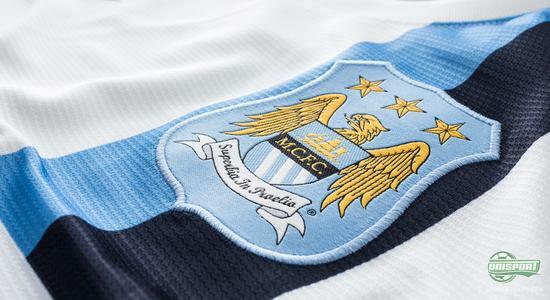 Will it be the shirt that takes Sergio Agüero and Yaya Toure all the way to the top? 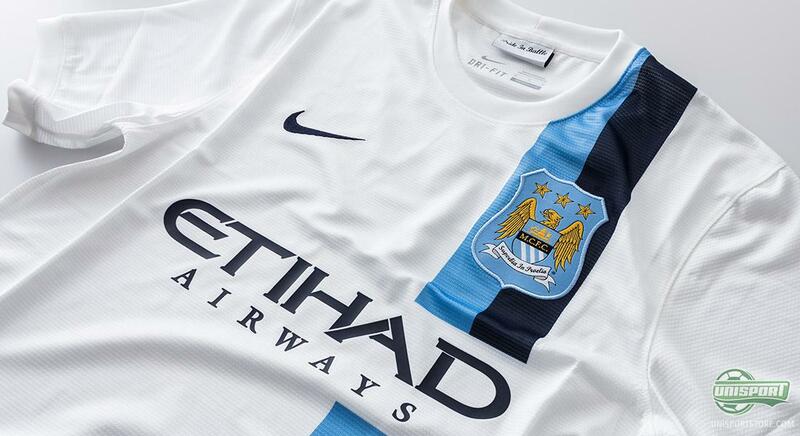 Only time will tell, but no matter what, Nike and Manchester City have certainly created a shirt worthy of trophy. 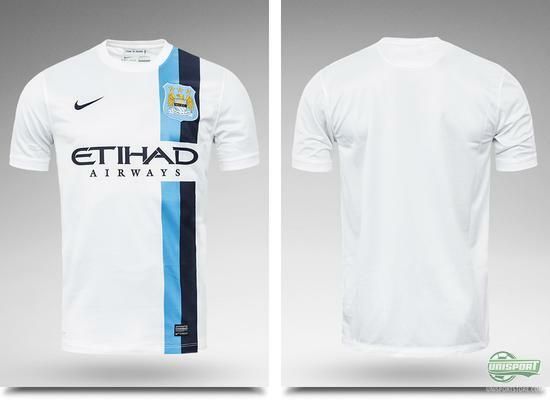 The new Manchester City third shirt both displays modernity and elegance with the combination of white and the sky blue and navy stripe. What do you think of the new shirt? And do you think Manchester City will have success in the Champions League? Feel free to share your thoughts here, or on Facebook and Twitter.